“How do I reduce expenses?” is the question that usually follows after “how do I increase the profit?” because they are closely linked. Increase in taxes and prices lead to a smaller profit if you cannot support a similar increase in your prices. What is left as a solution for keeping a positive balance? Reduce those expenses that stand in your power to cut down. What costs does my company have? Before deciding what to cut, first, you need to analyze how your expenses are structured. The fastest way is to look into your transactions history. 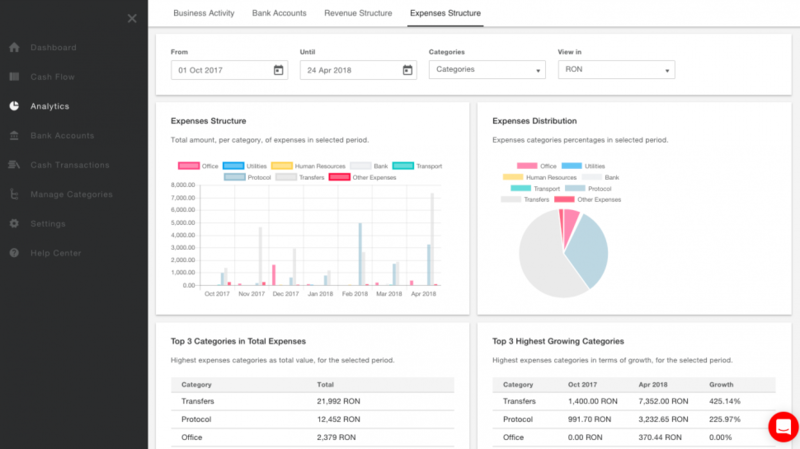 On the ThinkOut there is a designated section for the analysis of Expenses, where you get to see the percentage of the main categories, which ones grew the most and their variation over time. All this information helps you to spot those costs that usually get ignored, but add up in time and affect the final result. How do I cut down the costs? It may seem a piece of cake, but it’s not just about erasing numbers in a table. There are two questions that can be blocking: “where do I begin?” followed by “how much?”. No worry, there is a key called prioritizing. First choose the costs upon which you cannot possibly intervene: taxes, rent, salaries, subscriptions, utilities. Leave them aside, so you can focus on what you can change. Next take a look at what’s left, the other expenses that you can somehow alter. See how much each category weighs in the total and establish how important they are. Prioritize once more: which ones do you really need and which expenses your company could leave without? You don’t need to completely cut all of them; you can reduce quantities, frequency or get smaller prices. The most at hand expenses to decrease without affecting too much your business activity are the office supplies, food, and dining or entertainment. Check if you use everything you buy and look for brands with similar quality at smaller prices. If you buy large quantities of merchandise from your suppliers or you are their long-term client, you could negotiate discounts either for quantity or for paying before the due date. Although it is very important to build a long-lasting relationship with suppliers, if you have to, you can always look for other offers at smaller prices. Think about outsourcing those activities that you don’t really need to support in-house. You’ll cut down important salary related costs, not to mention the time and money that would take to train someone new for something that is not your core activity. Cloud services are a great option if you cannot afford your own servers. You can also use such solutions to share documents with your team and clients. This way you won’t need to print all those files that end up thrown away anyway. Think about how much paper and ink you’ll save in a year’s time. Another good way to reduce expenses is to use some free online apps for various office tasks as an alternative to the expensive software. Just search on Google and you’ll find plenty of options to choose from. If your business activity takes place mostly online, you can consider remote work for part of your team. This way you can opt for a smaller office space that costs less. To sum up, when you need to cut down on expenses, before diving into those tables and formulas, first understand where the money goes, which costs are indispensable and add value to your business. Decide what you can leave without; don’t hesitate to cut even small amounts because, in time, they add up and can make a big difference for your company’s profit.